Taped on the wall behind Amanda Packard’s desk are colorful thank you notes. Between these tokens of gratitude and the bright orange desk chairs, you might guess this is an elementary classroom. However, it is not, and Packard does not teach small children. Rather, Packard has won the gratitude of seventh-grade math students. The scribbled notes reflect one of Packard’s greatest strengths in the classroom — building relationships with students. She believes investing personally in students helps her understand how to react to classroom situations as well as customize math lessons. While creating a foundation of student-teacher relationships, Packard works tirelessly to bring in new methods for communicating math through group activities, independent student learning, customized instruction, and classroom technology. She teaches six class periods a day at Midway Middle School (MMS), with additional periods for planning lessons and holding conferences with students or parents. As a testament to her creativity and effectiveness, Packard received the 2017 Teacher of the Year award for her campus, Midway Middle School. Packard credits Baylor University’s School of Education for preparing her to teach with confidence and experience right out of college. MMS principal Dr. Herb Cox said, “[Packard] builds really good relationships with her kids and as a result of that, she keeps them engaged and they work hard for her. We don’t have any discipline issues in her classroom.” Cox holds a BSEd 1979, and an Ed.D. 2008, from Baylor School of Education. Packard pushes her seventh graders to struggle through problems on their own before she steps in to explain an answer. She said students become too reliant upon teachers answering their questions. This causes students to have little motivation to work through difficult problems. Packard uses established bonds with the kids to observe their strengths and weaknesses in math. “We need to be teaching [students] how to think creatively, how to problem solve, and how to come up with new ideas,” Packard said. Alongside the other seventh-grade math teachers, Packard designs math problems that create a bridge between abstract and concrete examples — concepts she said students this age often struggle transitioning between because of their developing brains. Packard addresses this gap by giving her students practical math assignments, such as designing a cake that meets specific criteria for size and tiers. Often these problems are assigned to groups so that students can learn from one another. Packard grew up in Flower Mound, Texas, where she volunteered at church functions and fostered a love for working with children and helping people. After learning about Baylor’s student body size and the extensive field preparation education students received, Packard decided to become a Baylor Bear. “The field experience was a big draw to the School of Education — how much experience you get in the classroom and how quickly you get it,” Packard said. Packard knew she wanted to teach mathematics, but she assumed she would teach high school or elementary-level math. 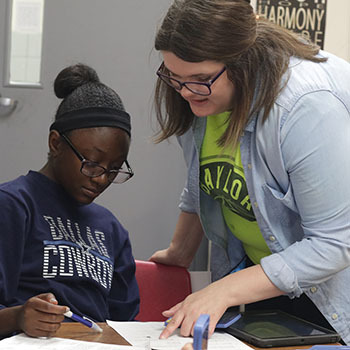 Teaching junior high math did not occur to Packard until she began tutoring junior high students at Cesar Chavez Middle School during her freshman year at Baylor. During her sophomore year at Baylor, Packard tutored online with a school in Frisco, Texas. In her junior year, Packard returned to Chavez as a teaching assistant and then taught at MMS for her senior year teaching internship. Packard transitioned so well into the classroom during her senior internship with her mentor teacher that students were surprised to learn three months into the school year that Packard was not a regular teacher. Packard introduced Nearpod, an educational iPad app, to her students and faculty members at MMS. As an intern, she led a faculty professional development meeting about the application. Dr. Cox said hiring Packard after graduation was an easy decision. Her strong leadership skills displayed as an intern have since proliferated over her first two years at MMS. When Packard’s fellow faculty members nominated her for the Midway ISD teacher award, she was surprised and humbled. Packard plans to continue building relationships and teaching seventh-grade math students at MMS. Eventually, she hopes to return to school. Wherever her future takes her, Packard’s goal is to impact students.